Chithiram Pesuthadi is the first Tamil film I’ve seen that thanks a roller skating stadium in the opening credits. So – possibly not one of director Mysskin’s typically dark stories based on crime and murder then? Well, no. Chithiram Pesuthadi is billed as a love story, but even in this first film from Mysskin there are plenty of fights, numerous gangsters and an underworld theme added into the plot. The features that I’ve come to expect from Mysskin’s film are also present, although less frequently here than in his subsequent films, but his trademark low angle shots of feet and a few odd camera angles from above still appear. Despite the underworld theme, in many ways this is typical love story where a boy from the wrong side of the tracks falls in love with a middle class girl and there are numerous obstacles to overcome. However there are enough fresh features to keep the story interesting, while Narain and Bhavana share good chemistry together, which makes the love story a little more believable than usual. 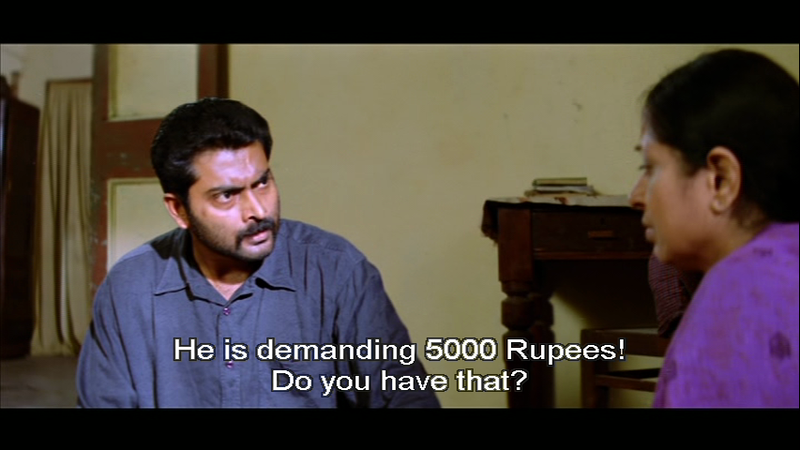 Thiru (Narain) is an angry man. He’s angry about the bribes he has to try and pay to get a job, he’s angry at his mother because he feels she prevented him from completing his education (which would have helped him get a job) and he’s angry at his sister because she needs money to finish her education (which means he has to get a job). This rage makes him an excellent an somewhat ruthless fighter, and when he inadvertently rescues local don Annachi’s son from a beating, he ends up recruited as a general enforcer and thug on call. The job with Annachi (Kadhal Dhandapani) allows him to vent his rage on a variety of hapless victims, although this doesn’t seem to improve his general disposition. However there is more to Thiru than his frequent flashes of temper suggest. He has his own code of conduct which he tries to adhere to, he has three loyal friends who respect him and despite his tantrums at home Thiru is trying his best to support his mother and sister. Inevitably, Thiru clashes with a girl who is equally angry, although Charu (Bhavana) doesn’t seem to have any real reason for all her aggression. She lives with her father and works alongside her uncle in an organisation which promotes the health and welfare of orphans. Charu is a crusader and is ready to leap to the defence of anyone she feels might need her support, whether they want it or not. This leads to several clashes between her and Thiru, whom she sees as a nasty vicious thug. Thiru on the other hand doesn’t seem to think much about her at all, until finally one day he starts to see her in a different light. Either that or he develops severe indigestion – it’s hard to decide from his expression but I’m pretty sure he falls in love. Either way, we end up with this amazing song which, although it’s the ‘falling in love’ song in the film, it doesn’t seem to have anything much to do with love and romance. Unless of course, I’ve missed some kind of symbolic significance in the way Narain is dressed as a Roman carrying a goat – or the many other bizarre situations in this song! Naturally Charu also changes her mind about Thiru and without even a sniff of parental opposition the two end up setting a date for the wedding. Of course Thiru’s decision to give up his life of crime and sell stuffed toys by the side of the road instead may have helped win over Charu’s father. But only, I suspect, if he didn’t actually see Thiru and his friends in these shirts. Charu and Thiru appear set for a life of wedded bliss when suddenly Mysskin appears to remember that this is a Tamil film and various tragedies beset the lovers. But here again, Mysskin diverges from the traditional path and allows both of his characters to behave badly. Both are selfish and unpleasant, although of the two, Thiru does get painted in a slightly kinder light. Charu is abrasive, obnoxiously rude to her father and dangerously confrontational throughout. When her relationship falters, she blames everyone but herself which showcases the immaturity of her character perfectly. Bhavana does an excellent job and even manages to create sympathy for her character’s challenging persona. Most importantly she cries convincingly and looks generally unglamorous and suitably ‘girl-next-door’ for the role. I found it quite impressive that she made me care about what happens to Charu (even if only superficially), as I really didn’t like the character at all. Narain also puts in a good performance, although he’s helped by the fact that his character is a little more sympathetic. Thiru is a man of contradictions and occasionally Narain splits his personality a little too much so that angry Thiru becomes too much of a caricature. However his Thiru is likeable despite the angry outbursts and casual violence. Thiru’s loyal friends are equally impressive, with each developing a distinct personality through the use of just a few little quirks in their limited time onscreen. I love how one of them is always eating – no matter how serious the situation or how inappropriate, he always has some food in his hands. There are plenty of similar little touches that make the characters feel more real, including the way Annachi rules his area from his banana yard, discussing deals and deaths in between the more mundane day to day activity of selling fruit. While the story develops smoothly, the songs seem to be added rather haphazardly and don’t always add to the film. There are also some very bizarre translations – I have no idea what assembling eyes with fingers is all about, but it does sound interesting. And of course the roller skaters! There is a better than usual item number with Malavika, but again it wasn’t really necessary, and most of the songs appear to be used more because songs are expected rather than as a way to further develop the story. Overall Chithiram Pesuthadi is an impressive début by Mysskin and illustrates why he has gone on to become such a successful director. He has the ability to spin a good yarn and keep the plot interesting, even with unlikeable protagonists and relatively dark themes. Good performances, a new twist on an old story and some clever character development combine to make Chithiram Pesuthadi well worth a watch, and definitely a cut above most other first films. 4 stars. This entry was posted in Kollywood and tagged Bhavana, Chithiram Pesuthadi, Kadhal Dandapani, Mysskin, Narain, Tamil. Bookmark the permalink. Thanks – I agree! What did you like about it?